Whenever you start typing a search query into Google, it will try to anticipate what you are looking for with an autocomplete function. This can be a useful starter exercise at the start of a topic to discover what central questions surround it. 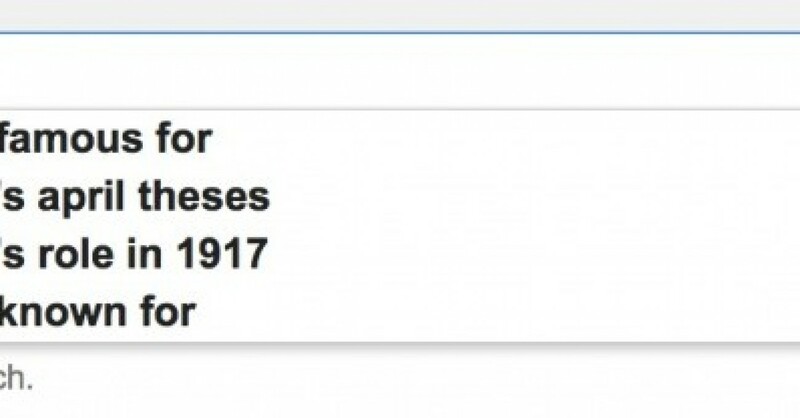 For example, if you are about to start studying Lenin, get the students to start typing various question stems into Google (“Why was X…”, “How far was X…”, “What was X…”, “Where was X…”, “Who was X…”, “How important was X…”, “When was X…”). For each, students should start to build up a list of what Google auto-suggests might be an interesting avenue of enquiry. Take a look at the following examples, based around the idea that the class is just about to start studying Lenin. With absolutely no prior knowledge of the topic, this quick and easy technique allows students to swiftly get an idea about some of the central issues surrounding the topic. Different students could then be given the responsibility of researching the answers to different questions as an opening task.